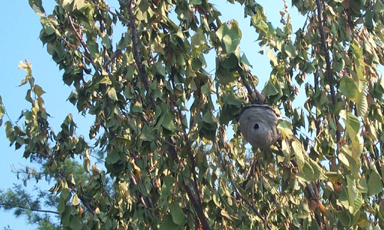 Henry, check out this Wasp's nest right by your grave. It appears to be a very inclusive cemetery. That's a really bad grown up joke. We were the kings of bad jokes, no, silly jokes. But this nest is cool and very active. The wasps are flying in and out. They can't bother you. Mom says that Joe looks nothing like me. True. Luckily, all of you look like Mommy. However, Joe-Joe just got a black eye by running into the coffee table. Now he looks like all of the pictures of me from when I was little. You were a really cute kid. I think this photo was taken at the beach. 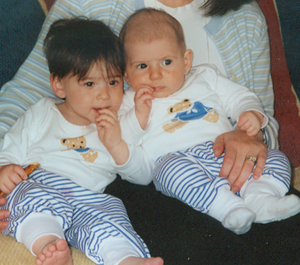 I never thought Mom and I would be the kind of parents to dress their kids alike, but here you go. I think you are a little older in this picture than Joe is right now. The minivan seemed really empty this morning. I have been riding my bike to work lately and it was strange being in a car. I looked over at Mom's CD holder which has a picture of you, Jack and me on its cover. I was listening to music that was pretty but sad. You know what happened next. I think I'll go back to the bike. I hope Mom doesn't mind me doing this, but here is an email from her. I miss Henry because of this and also because I asked Jack if he wanted to go out for pancakes for dinner after I get him from the bus and he reminded me that he doesn't like pancakes. Oh my god, I would have loved to have taken Henry shopping here online. Do you think Jack would want something? I wish I had found this website earlier. I love you, big fella. I am writing to you from The National Cathedral. I am sitting on a bench across from Bishops Garden. Michael is going to camp here again this summer. Do you remember when we dropped him off here last year every day for a week. I know that you had to walk a long way and it wasn't easy for you. I hope I didn't push you too hard. Michael slept over last night. He is one handsome, smart, funny and talented kid. I watched him do jumps on his roller blades yesterday and he is so good at that and anything he tries. I am sure he can accomplish anything he wants in life. I wonder if he'll be a doctor or professional surfer. Maybe both. He came down early this morning and sat with me and Joe and watched The Lion King. He has that booming voice that sounds like he is seventeen. I was worried that he'd wake up Mom and Jack but he was quiet. It was nice. He is the best big cousin you could have ever wished for. You'll be glad to know he is taking good care of Jack. Well the reason I am here at The Cathedral is because Joe fell asleep in the car and I was looking for a good place to hang out while he snoozes (the two of us had dropped off Mom and Jack at the movies - SpyKids 3 is out). We'll go to the park when he wakes up. I have the door of the minivan open and he is right in front of me flopped over in his car seat. All of these tourists keep walking by saying how cute Joe is. I hope no-one wakes him up. He didn't nap today. We all went to the zoo this morning after Michael left. A kid from Jack's camp was having his birthday party in the Bat House. Jack didn't want to go to the party because he said that the birthday kid hit him. That made sense. We left the gift and went to explore on our own. I hope we didn't get him anything too good. We saw the pandas getting fed. It was pretty hot and miserable so we didn't stay too long. The gargoyles are overhead. They are really ugly and funny and really cool. Did we ever check them out after camp? I am sure we did. 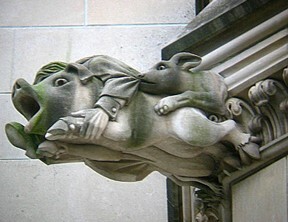 I think most people have no idea of the wild things attached to this building. Don't always look straight ahead. Sometimes you gotta look up, right. I am so glad the Cathedral people have a good sense of humor for such a serious place. I came here with Pop Pop Teddy for Eisenhower's funeral. He had almost as many people as you. It is nice and peaceful here. A good place to write, read or think. Last night Mommy and I went to another neat place. 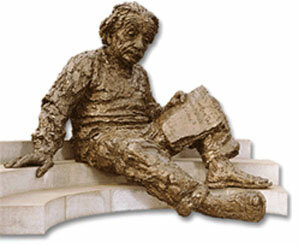 We went out to dinner with Helaine and Richard, and after dinner we went to go see the sculpture of Albert Einstein on the grounds of the National Academy of Sciences. I think we all went there together once. You may have sat in his lap. That's a popular thing to do. You and I also went to see the The Awakening, which is another sculpture by the same guy. It was good to see Richard and Helaine. I don't know what Jake is doing this summer. I bet he is at some kind of sports camp. I have no doubt he is going to be a great baseball player. Do you remember reading the story of another great Jewish ballplayer, Hank Greenberg. He is a hero of mine. I always told you when we were going to bed at home or the hospital how you are my greatest hero. Well, I have a couple of other heroes. I never got a chance to tell you who and why. There is Jackie Robinson, Albert Einstein, Winston Churchill and Hannah Szenes. On another day I'll tell you about them. Jack's camp actually ended a week ago. He spent a lot of last week in St. Michaels with Nana and Papa Sy. Joe and I picked him up in Annapolis on Thursday night. We met him and Nana and Papa Sy at an ice cream parlor right at the dock. It was a different ice cream parlor than the one where Uncle Bill gave you your first taste of ice cream. When I drove home with Joe and Jack I thought back to that time last summer when I was on Uncle Andy's crew one night when he raced his boat off of Annapolis. I had to drive to St. Michaels after the race and pick up you and Jack and drive you back to D.C. There was a huge traffic jam and we got back at 1 am or something. Uncle Bill and Cristina left for Spain yesterday. I am sure it will be nice when we go with them some summer, but sad all the same. We have that experience whenever we go back to places where we used to go with you. Yesterday we went to the Great British Pine Mine, that store in Kensington where we've bought furniture in the past. I could not help thinking back to the last time we were there last summer with you and Jack and Joe. You guys were running around the stacks of armoires and chests and the two of you kept hiding in drawers and hutches and cabinets and I had to find you. There were a lot of laughs and giggles that day. I wondered if the people who own the shop were going to ask where you were because you always came in with us. I guess they were too busy or didn't notice or something. The reason we went there was because we are going to get rid of the armoire in the family room and get something smaller. The television in the family room broke (Mom and I were very excited, maybe me more than she) and we want to get a new one. We need to find something for a new TV to sit on and that is why were going to trade in the armoire. Joe says a lot of words right now and has maybe even pieced together a sentence. Zhenny is his main translator. Every day I work with Joe teaching him to say "Henry." I sat him on my lap yesterday and we looked at photos of you on the computer. I pointed to Jack in the photos and said "Jack." Then I'd point to you and say "Henry." Every time I pointed to a photo of you and asked Joe to repeat "Henry" he'd say "Jack." This is going to take a while, but we have time. Oh, you'll love this. Jack's new favorite phrase is "No Joe!" I am back home now with Joe. He woke up and we went to Guy Mason. The bells were ringing at the Cathedral or church next door or somewhere close by like they do every Sunday at 6 pm. Whenever you and I were together outside and heard them I would count them out to you, dong, dong, dong, dong, dong, dong. Hen, I tried to hear your voice in my head tonight. It is fading from my memory. I need to pull out some of the videos. WHEN PEOPLE ASK BARRY KLUGER of Scottsdale, Ariz., if he has any children, he replies, "Yes, I have a daughter. She died in a car accident last year. She was 18." His word choice startles people, he says, but it's deliberate. He won't say he "had" a daughter. "I have a daughter. Erica still lives in my heart." Reggie Peppers of Houston keeps a photo of his daughter, Morgan, on his office desk. In the picture, she's two years old, her age in 2000, the year she died choking on a grape. Whenever passersby notice the photo, Mr. Peppers has to explain her death. It's painful for him, but he says removing the photo would be "cheating her memory." Thomas Meehan of Carteret, N.J., always wears a photo of his 26-year-old daughter, Colleen, on his belt. She died on Sept. 11 in the World Trade Center. Because "no words exist" to describe his anguish, he says, he displays her smiling face as "a silent way to make people aware of our loss." Last week, this column focused on the language of grief -- and how there is no word to describe parents who have lost children. In response, these three dads, and 256 other bereaved parents, wrote to share their thoughts about how our culture talks about death. In heartbreaking e-mails, they told of words that buoy them, and words best left unsaid. 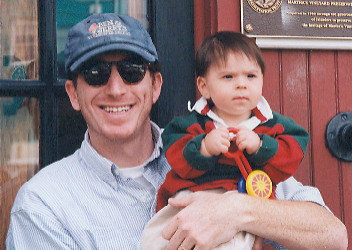 Dads wrote of how they'll struggle on Father's Day, hoping friends offer a few kind words. Mr. Kluger lost his only child, but on Sunday, "I'll still be a father." Many bereaved parents wish people would acknowledge their loss with a simple "I'm sorry." Last year, Alexandra Smallberger of Blue Bell, Pa., gave birth to a stillborn daughter. Many of her co-workers never said a word about it. On her computer, she displays the baby's footprints in a frame. "Only one person has commented on it," she says. Janice Schacter's son died during delivery. "He never took a breath, so most people don't consider him a child," she says. But because he was Jewish, he was named and circumcised before burial. "Am I supposed to pretend that a child in his grave doesn't exist?" Ms. Schacter asks. Trudy Pierallini's 26-year-old son died last year in a motorcycle accident. She says most of her friends now avoid her and her husband. "They think we're contagious. Just when we need them the most, they're gone, too." Many parents told horror stories about insensitive comments. Rosita Kintz of Lansing, Mich., lost a child to leukemia and two children to cystic fibrosis. A friend, trying to explain why so much tragedy visited one person, said: "In a former life, you must have been one of the people who nailed Jesus to the cross." After Jacquelin Payne's six-year-old son drowned, a relative said to her: "It's just as well. He might have gone bad when he grew up." As grieving parents struggle to talk about their children, others often respond with oblivious disregard. Lisa Austin of Dillon, Colo., was recently interviewed by a career counselor. Asked how many children she has, Ms. Austin said, "Three. One is 13, one is 11, and one is in heaven." The career counselor replied, "So you have two." "If people could visually see our wounds, they'd see we've been opened from neck to pelvis, with all our insides hanging out," says Ms. Austin. Other parents also wrote of feeling "mutilated." "Part of us has been amputated," says Ted d'Afflisio of Lincroft, N.J., whose 18-year-old daughter, Michaela, died in March. "We continue to function, but the stump will always be there." GERALDINE RHEINGOLD IS AN orphan, having lost her parents in the 1950s. She is also a widow; her husband died in 1978. But she is something else -- a parent who has lost a child -- and there is no simple word in our language to describe that. Mrs. Rheingold's daughter Didi died of pneumonia in 1949 at age eight. Though she has another child, for 53 years Mrs. Rheingold struggled to define herself after that tragedy. Now, at age 93, these are the 11 words she chooses: "I was a loving parent who no longer has that privilege." If only our language offered one special word to encompass that mix of loss and love. Some grieving parents say they long for such a word, something they could say when asked, "Do you have any children?" They yearn for a word that honors their late child without inviting prying questions, a few syllables they could deliver quickly, without choking up. Surviving parents in growing numbers are talking about rewriting the language of grief. When Mrs. Rheingold's daughter died, there were no support groups to help her. Now, the organization Compassionate Friends (www.compassionatefriends.org) has almost 600 chapters -- triple the number it had in 1980 -- serving 300,000 parents who've lost children. Still, words fail us. "Linguists say that words reflect how society thinks," says psychologist Bob Baugher, who leads grief workshops around the country. "Because there's no word for parents who've lost children, it shows how awkward we feel about them." The English language has about 450,000 commonly used words, but more may be needed. What do you call someone who has lost a sibling or had a miscarriage? Or a gay person whose partner has died? Or an elderly person who has lost every friend and relative? So many heartaches can't be found in the dictionary. Last year, Susan Giardina's only child, her 22-year-old daughter, died from a brain tumor. People often ask Ms. Giardina if she has children. "Answering, `I had a child who died' rips my heart out," she says. But replying that she has no children "would feel like a betrayal" of her daughter's life. "If I could say, `I'm a widow,' I wouldn't have to go into details." Generations ago, when it was common to lose children to diseases, people had large families. Language researchers suspect that society didn't want to define parents by their loss. But families are smaller now, and the loss of one child leaves a void that can feel more cavernous. Jeffrey Kacirk, author of "Forgotten English," has never come across a word for parents who've lost children. Neither has Mrs. Rheingold's son Howard, author of "They Have a Word For It," a book about words in other languages with no English equivalents. When I contacted him for insights on word derivations, he said I'd learn more from his mother. Indeed, Mrs. Rheingold welcomed the chance to talk. From her home in Mill Valley, Calif., she told me that when her daughter died, Howard was 17 months old. 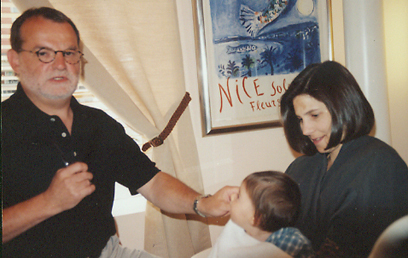 "Minutes after my daughter died, my husband and I were crying terribly," she recalled. 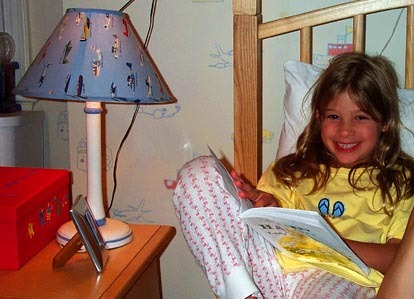 "We held hands across her bed and said, `We won't talk about her and how she died. We won't bring this sadness into our son's life.'" They kept the vow for decades. Sometimes, they'd speak to each other about "the beautiful red-headed girl we lost." But to outsiders and their son, they said little. Until she was 75, Mrs. Rheingold says, she dreamed about her daughter nightly, saying nothing to anyone in the morning. She is relieved that many parents today are more open about their losses. "It's so much healthier." Now that parents are talking more, they're more aware of the shadings and inferences of language. Harriet Sarnoff Schiff lost her 10-year-old son, Robert, in 1968. For years, when people asked how many children she had, she'd often mention only her two living children. "Then I'd cross my fingers behind my back and think, `Oh Robbie, I'm not denying that you existed.'" She wrote a book in 1977 titled "The Bereaved Parent," and some parents now use that phrase to describe themselves. But it doesn't work for Joyce Andrews of Houston. Her 36-year-old daughter took her own life in 1990. "I wish there was a word that did not say, `I am continuously sad,'" Ms. Andrews says. "As time passes, and your grief softens, you don't like to put that label on yourself." David Pellegrin of Honolulu says losing his son has shown him "the profound limitations of words." He dislikes "closure." "People say it with a hint of impatience in their voices: `Have you reached closure yet?'" Surviving parents also are troubled by sentences that begin with "at least." "When people say, `At least you have another child,' it never helps," says Mr. Baugher, the grief educator. Wayne Loder of Milford, Mich., lost a son and daughter, ages five and eight, in a 1991 car accident. Among the useless comments people have made to him: "God wanted more flowers for his garden." For surviving parents "finding the new normal" means making their own rules. For some, it helps to talk about their late children to every acquaintance. Others say that as long as their children are in their hearts, what they say out loud is less important. My in-laws lost a son in 1982. He was 24, and just beginning a law career. "People who've lost children have a heightened awareness of everything," says my mother-in-law, Marilyn Margulis. "Words are sharper and more meaningful, because you're vulnerable and in pain." She encourages grieving parents to forgive inappropriate comments and poor word choices. "People are clumsy and apprehensive," she says, "but whenever they extend their hands to you in sympathy, understand that what they're trying to say is, `I'm so sorry.'" Here is a photo of us from Martha's Vineyard. We are right outside the carousel. it is one of the oldest in the country, if not the oldest. 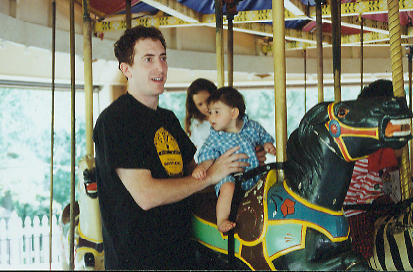 Carousels = Henry smiles and giggles. I wish the rides didn't have to end. Mom made a a pile of stuffed animals and Beanie Babies that aren't getting attention from Jack or Joe. I found HeroBear! I bought it for you at BigPlanet Comics in Bethesda. 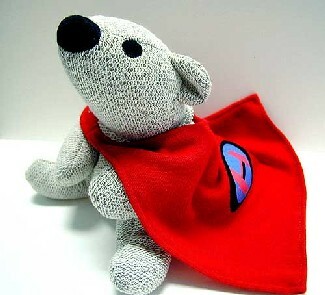 I was so excited because he had an "H" on his cape and I thought that it could stand for Henry and for HeroBear. I bought the comic book too, but it was written for older kids. I remember thinking that one day we'd pull it out again and it would be perfect for you. HeroBear is now sitting next to our bed. 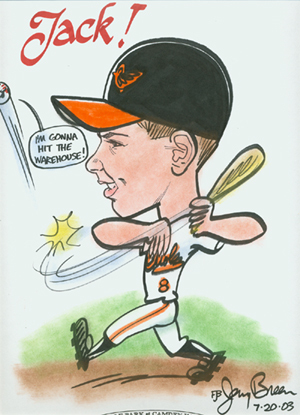 Jack went to see the Orioles play this weekend with David Lane and his grandparents. I can't believe we all went to a game together last summer. They might build a baseball field near my office. We need a team here in Washington. It would have been nice to take you and Jack and Joe to a game after work or on the weekend. Me and my boys. Mom made it back okay. I've been looking at some old pictures of you and me. Here is a neat coincidence. Last week I was feeling a little down during the day and I went on the Internet and started looking at Batman stuff. There was one website that sold Batman lava lamps. How cool. Well, guess who else started checking out Batman stuff last week. Jack. I came home from work that same night and Jack was watching one of our old Batman videos. He also had gone to Sullivan's and bought this totally awesome Batmobile. All of a sudden Batman was back after months of being gone from the house. The reason Jack was able to buy the Batmobile is that he made $40 for being in a television commercial. Did I ever show you the McDonalds commercial I was in a few years ago. I hope you saw it. It was funny. I'll ask Mommy. Mommy is coming back from St. Michaels tonight. Guess what. Aunt Alice and Uncle Peter bought a house there not too far from Papa Sy and Nana's house. I'll put some photos here after I visit. The sad thing is that their beach house is being sold. 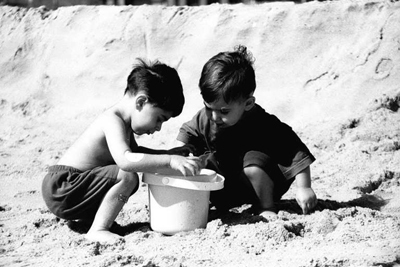 Here are you and Uncle Peter at the beach. I have a lot of great memories of you from that house. Mommy and I have both said that we will never move from this house. We can't. I guess it is a way of holding on to you as best we can. I wonder if we'll always feel this way. I hope so. This is your home. You're here. It's pouring out. I hope Mom is okay. I'm going to go call. I love you Henry. Love, love, love, love, love, love! I drove by Daniel's house this morning. I know you missed him a lot when you both left The Gan and went to different schools. When life became no fun for you, you talked a lot about Daniel and the good old days. You were so young to be nostalgic for the past. That is called "reminiscing." I do that in my own way. When life is really hard I think back to when life was easy. Sometimes I think about when I was in my twenties. Sometimes I think about the years before your transplant. I'm sure in a little while when I reminisce about when life was easy I will think back to the past seven years with you. I had to drive by Daniel's house this morning because I needed to drop off Jack's blanket at Debbie Barr's house. Jack is out in St. Michaels with Mommy and Nana and Papa Sy. Debbie is going out to St. Michaels later today and will deliver Jack's blanket. I wonder when he'll grow out of that. Joe is a blanket fiend. Unlike you or Jack, Joe insists on bringing his blanket everywhere. I used to try to get him to leave it in his crib, but I get nowhere with that stubborn little brother of yours. He drags it with him everywhere. I don't know if Mom and I will have the strength to wean (that means to get him to gradually stop using it) him from his blanket and pacifier when the time comes. I just talked to Mom on the phone. Jack is out fishing. I hope he catches something. I am super sad these days. Mom keeps saying that we are moving from the shock of you dying to learning how to live without you. Normally when I think about you during the day either I cannot accept that you've died or I think that it is okay. Right now I all I think about is how it is not okay. All I do is miss you. I feel like I am always on the verge of tears. I took Jack for a haircut this weekend at Bradley Barbershop. I sat with Joe in a chair across from Jack. Joe stood on my thighs and studied his face in the mirror behind us. I looked up and down the row at all of the little boys getting little boy haircuts. Their dads all watched them. I thought back to every haircut you ever got. I thought about the haircuts you had when your hair had fallen out a second time and you looked so scraggly. You fell out of the chair and the woman cutting you hair was very worried. I helped you back up. After a while you got settled in and before long you were beaming. 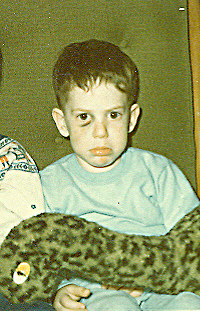 I am angry that you had to look so beat up. I am sorry that you got old enough to know and care. I am so proud that you tried to not let it bother you. I pulled Joe close and buried my face in his stomach. Thank god for Joe. My shield. 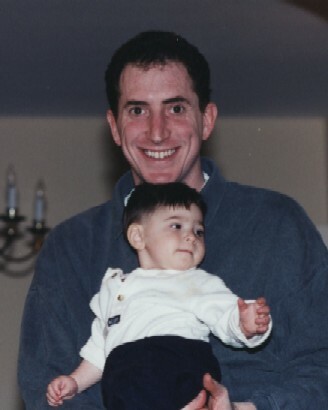 Here is a picture of you getting your first-ever haircut. Robert has cut my hair for the past 18 years. I brought you to him right before your last day of kindergarten. I remember I was a little desperate to try to get you looking a little better because you had been through a rough spell. Hunter Kelley, 7, is on pins and needles as he awaits the arrival of his new baby brother. His very life may depend on it. Correspondent Susan Spencer reports. Randy and Christie Kelley of Birmingham, Ala., have just what they've always wanted - a houseful of boys. First came Taylor, then Hunter and finally Parker. Everything seemed perfect until Hunter turned 5. "He'd always been small, so we kind of questioned that," says Hunter's father, Randy. "And his blood counts were deteriorating." At his annual check-up, routine tests showed Hunter's white and red blood cell counts were dangerously low. So doctors ran more tests. The diagnosis? Fanconi anemia, a rare genetic disease in which the bone marrow fails to produce healthy blood cells, leading to infection, cancer and ultimately, death. 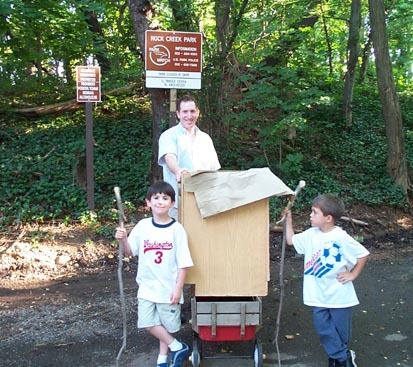 "Very rarely did children make it to adulthood," says Randy. "The average life span is between 8 years old and 12 years old. So it was pretty bleak." When they married, the Kelleys had no reason at all to think that one, much less both of them, would carry the Fanconi gene. So the Kelleys sought out Dr. John Wagner at the University of Minnesota, one of the few Fanconi experts in the country. "Most of the children who are left untreated will die of bone marrow failure," says Wagner. "For those that live long enough, they'll develop leukemia." In fact, Wagner told the Kelleys the disease is so rare that Hunter was lucky his doctor even recognized it. Now, a bone marrow transplant is the only answer. And Wagner would have done one two years ago if he had found a match. 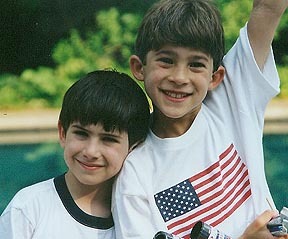 The best prospects for donors were brothers Taylor or Parker, but they were not Hunter's match. The Kelleys then turned to a bone marrow registry, where the odds of a transplant succeeding were only 1 in 5. "We still knew that the best chance of his survival was to have a sibling match," says Randy. "We found out there was a way to get one." They decided to have another baby created in the lab from Christie's eggs and Randy's sperm - by only using embryos that had been genetically screened to be healthy and a perfect match for Hunter. The Kelleys knew this was a long shot. It had only worked for one family. "We just need a baby that matched my blood so we can have help for me," says Hunter. Meanwhile, Hunter looks good and seems to feel fine, but everyone is very aware that with his disease, time is a relentless enemy. It's too risky to go to school given the risk of infection, so Hunter works with a tutor at home - waiting until his new brother arrives. "We knew that it would not be easy, that the odds were against us," says Hunter's mother, Christie. "But we had to try." In creating a made-to-order baby, nothing could be left to chance. The Kelleys turned to Andrew Toledo, an Atlanta infertility specialist now faced with a challenge - to produce a baby with the same blood and tissue type as Hunter. Embryologists used a controversial and cutting-edge technique known as pre-implantation genetic diagnosis, or PGD, to select only embryos with just the right stuff. But PGD makes some ethicists very nervous because it has implications well beyond just screening for disease. For example, the same technology would have let the Kelleys screen for a girl, or look for physical traits such as hair and eye color. But the Kelleys had less than a 20 percent chance of producing a matched healthy embryo. They succeeded three times, but Christie couldn't get pregnant. Insurance covered much of their cost, but many families aren't so lucky. "It's technology for people that can find the financial resources that will allow them to do it," says Wagner. Finally, more than a year after Hunter's diagnosis and after six months of trying, both embryos took - disease free and perfect matches - twins. But early in the second trimester, the Kelleys lost one of the twins. They were left with one baby with a big responsibility. "We call this our special baby," says Christie. "This baby is being sent here to us to help him get well." Every detail of this delivery has been planned for months. And if all goes well, doctors will use blood from the baby's umbilical cord for Hunter's bone marrow transplant - a perfect match. Cells from the cord should "take" and grow, giving Hunter a healthy new immune system. Randy is taking no chances. He will hand deliver the blood 1,000 miles from Alabama to Minnesota to be processed for the procedure. "This is one thing that's going to help save Hunter's life and I want to protect that with my life," says Randy. During the delivery, Hunter stands at the interior door of the hospital room, waiting and seeming to understand the enormity of the moment. Cooper Graham Kelley is born, and it's clear that he's in perfect shape. After the delivery, Randy delivers his precious cargo to the University of Minnesota Lab. The actual transplant won't happen for several weeks, but Cooper's perfectly matched blood will be waiting. Now, it's Hunter's turn. Randy has set up an apartment in Minnesota, and he plans to keep up with his sales job at Kraft Foods via computer - while watching over his son. The Kelleys won't be together for long. Once Hunter's treatment starts, brothers Taylor and Parker will have to go back to Alabama to stay with Christie's family. Hunter will undergo a week of powerful drugs that will wipe out his damaged immune system, clearing a way for a healthy new one built with his baby brother's blood. But it's a huge gamble. Hunter's immune system is about to be totally destroyed, leaving him defenseless against infection. Randy also worries that this frightening experience will somehow change his son. "Will it kill his spirit," he asks. "Will he be the same cart-wheeling, baseball playing Hunter that I had before?" Hunter celebrates his 8th birthday on the transplant ward soon after he begins chemotherapy - and the treatment has started to take a toll on him. Four days after his birthday, it's transplant day at last. "This is the start of what we hope is a healthy life for Hunter," says Christie. But the coming weeks will be difficult. 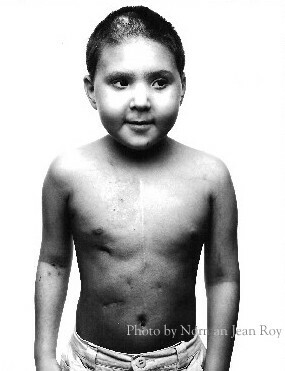 Hunter's small body will have to adjust to both the drugs and the transplant. On Day 21, they will know if the gift of life from brother has helped save the other. "He's going in for a bone marrow biopsy," says Randy. "Nervous for how Hunter's going to feel when he comes out of it." With Hunter under anesthesia, Dr. Wagner takes a sample of bone marrow from his spine. The news is astonishing. The transplant worked - and worked so well that Hunter can now leave the hospital and be reunited with his brothers, family, neighbors and friends. "We are by no means out of the woods," says Randy. "He can still get fever or infections, but we feel happy because we've come so far this quickly." "The chances are in his favor that he will do well and be back to normal in the not-so-distant future," says Dr. Wagner. I posted this email on here back in May, but I'm putting it back up to show you again. It is really nice. They seem like a great family. I am betting Hunter is going to do really well. He and Cooper are both very special boys. Here is a photo of Hunter fishing. I don't think you know me but boy I sure know you and Henry. I have been struggling with the right time to write this letter. I am the father of Hunter Kelley. Hunter too has FA. 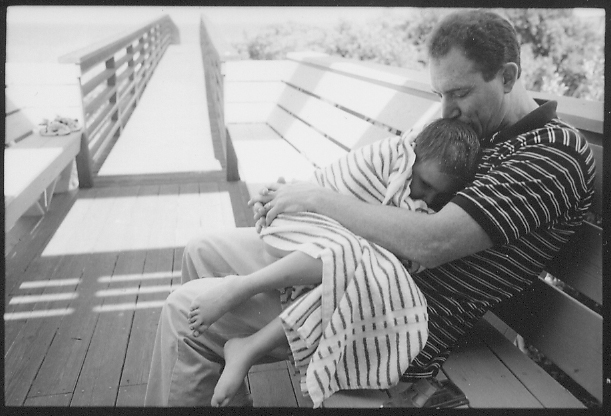 On March 15th 2000 Hunter was diagnosed. I am not going to tell you the feeling because I think you already know. 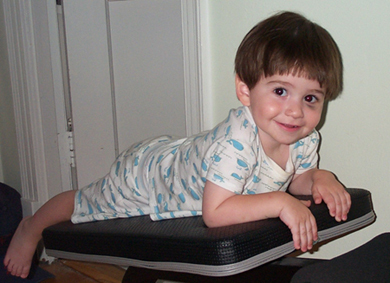 For a year and a half we searched for answers as to how to help Hunter. 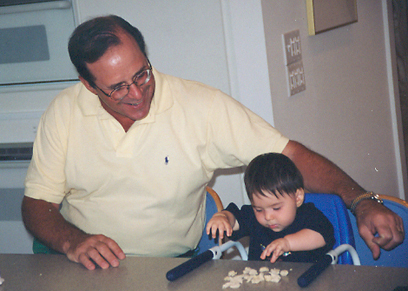 We attended a FA Family meeting in Sept. of 2000, mainly to meet Dr. Wagner. While at the meeting we learned for the first time about PGD. We had no idea this opportunity existed and soon found out it didn't' for us. 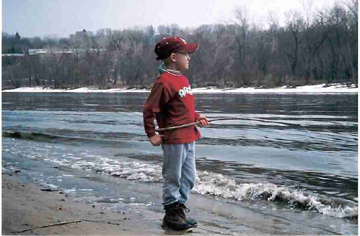 In Oct. 2000 we went to U of Minn. for a bone marrow harvest, Hunter's cellularity at the time was 50%. During this visit we met the Nash's and even went to the Mall of America with them. We wanted so badly to try the PGD but it wasn't available to FA (A) at the time. 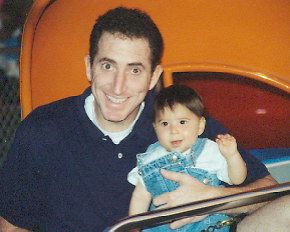 In Oct. of 2001 we learned that FA (A) had been typed by Dr. Auerbach and that PGD was now available to FA (A) patients. It was about this time my wife (Christie) read your New York Times Magazine article. We immediately decided we had to give PGD a try. After 4 cycles and many ups and downs we got pregnant. Eggs were implanted on Easter Sunday of 2002. On Dec. 9th Cooper Kelley was born. A perfect match for Hunter. On January 21 Hunter underwent a Sibling Matched Cord Blood Transplant at the U of Minn. Today we are back in Birmingham and Hunter is outside shooting basketball. We realize he is by no means out of the woods, but to this point he is doing great. The reason for writing this letter is to thank you and especially thank Henry. You see if we had never read that NY Times article we would have never tried PGD. Hunter was to the point he needed a transplant and we didn't have long. You determination to succeed at PGD gave us inspiration. Henry did not die in vain. Henry is a pioneer that has and is saving Lives everyday. I can only imagine what it is like to loose a son. Hopefully you can find some comfort in knowing without a doubt you and your son helped save our son's life. The TV show 48 hrs. has followed our story from beginning to end. We are not sure when it will air, if ever. Hopefully it too will help someone see the light at the end of the tunnel. Thanks Henry Goldberg your sacrifice has saved many. Yesterday was a really full day. In the morning Joe and I went to the "Train Park" on Macomb Street. It was the first time I've been there since you died. I could see you climbing on all the equipment. I remember you running around on the field with all of your buddies. Those days after school let out and everyone went to the Train Park were the best. What I can't understand is how you died if you were so strong. 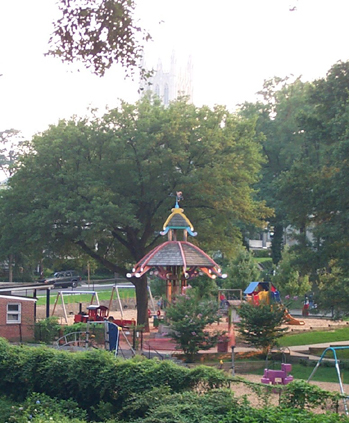 Here is a picture I took of the Macomb "Train" Park. If you look close you can see the train and the Cathedral, which is in the background. At 11 am we had a big party. Jack was sad that we didn't have your transplant anniversary party last week so Mom whipped up a "Happy Summer" shindig. All of the cousins and a bunch of Jack's friends (and yours) came over for popcorn (we rented the machine from the Party Warehouse), cake and wild animals from the Catoctin Zoo. You'd think we had our fill with the possums, but no. We had a hedgehog, an Amazon parrot, an alligator, a bearded-dragon lizard, a chinchilla and a Burmese python. 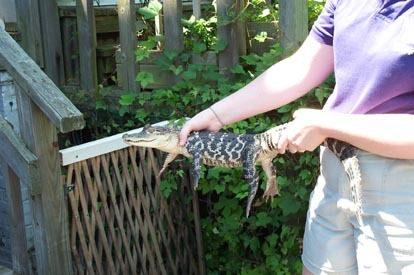 I am still very freaked out by the thought of anyone touching reptiles because the majority of them carry the salmonella bacteria. My mind is still working like you are here and we need to protect you from infection. I wonder when I'll be able to relax about that. I am aware every time I share a drink or food with Joe or Jack. I cannot help but think about how we could not share the same glass or straw or anything with you. We didn't want to get you sick. The party was a blast. Mom, of course, put together killer party bags. I told her she should start her own business, PartyBags.com. I bet one already exists, but Mom would be the best. Later that day we brought Jack to Matthew's birthday party which was rock climbing. The indoor rock climbing "gym" was near the cemetery, so Mom and Joe and I came by to say hello to you. It was beautiful out. Strangely, it isn't very humid right now. It almost feels like summer in Minneapolis. We hung out with you for a while. The funny thing is that the cemetery is maybe the one place where we feel safe that Joe won't kill himself. Normally he tries his best to pull things down on him or jump off things or run into stuff. When we are out with you Joe has plenty of room to run around and not get hurt. The Pokemon coin is still on your grave marker. I was glad about that. We tried to leave a stone but Joe picked it up and ran off. Silly kid. Such the little brother, right. When Mom put Joe back in the minivan I went back and placed the stone on your marker. I got on my knees and kissed the ground. The grass was very scratchy. Whenever you kissed me when I hadn't shaved you would say I was scratchy. Sorry about that. It was super nice to see you. After we left your grave, Mom and I went and said hello to Grandma. On the way out we stopped and visited Allison Atlas. Her family helped us a lot when we were trying to find someone to donate new blood for you. Just like you, Allison died because they couldn't find anyone who was a close enough match. Mommy signed up to be a bone marrow donor when she heard that Allison needed new blood. That was 10 years ago. On Allison's grave it said, "Her courage changed the world." I hadn't cried up until then, but reading that on her headstone just got me going. It also said, "One Singular Sensation." That is a song from a Broadway musical that I am sure Allison must have really liked. It also describes her. I am glad we are putting, "The Boy Who Lived," on your headstone. I love you sweet boy. Your courage also changed the world too. Here is an update. Rachel bailed out, again. This is the second time she has come over for a sleepover and decides that she needs to go home. I didn't write to you very much last week because I was going to bed very early. I had to wake up each morning a little after 5 am because I was going down to the Potomac river in Georgetown for sculling lessons. A scull is this teeny tiny boat and you need lessons to learn how to row it. 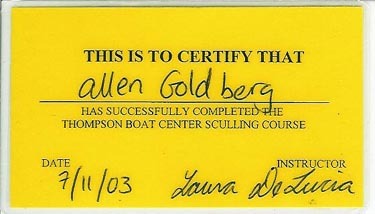 I passed the beginners class and got a card that lets me rent sculls without an instructor. I have this image in my mind of going out in both St. Michaels and Georgetown, and just being alone with my thoughts and the water. Right now my thoughts are all about not falling in so I have a long ways to go. 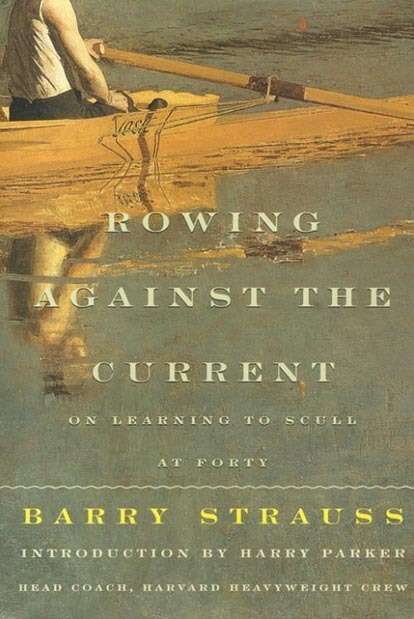 I was looking for some books that might have a good Pokeball image for the headstone people and I came across this book on sculling. It seems I am not the only 40 year old who thought of this. So Hen, check this out. We had a little excitement today worthy of the crocodile hunter, crikey. Picture this. The other week we ripped out the cabinet in your bathroom to replace it with something nicer. I put the old cabinet out on the deck off the kitchen. I figured that I'd take it to the dump with some of the junk that we cleared from the basement. Well it seems that this abandoned, empty bathroom cabinet makes the ideal nesting place for possums. Check out these little rippers. 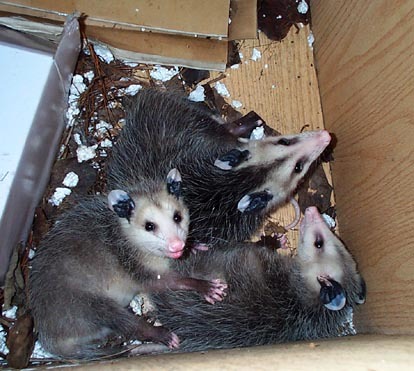 I called the people who take care of rescuing wild animals in Washington, DC and they said they were too busy to come get the possums. They suggested we just relocate them ourselves. We asked David Lane if he wanted to help. He ran over, and we all set out for Glover Park, down at the end of 39th Street. When we got there I tipped the cabinet over. When the doors swung open the wee blokes hit the ground and scampered off. The funny thing is that one headed not into the woods but into someone's backyard. Oh well, we tried. 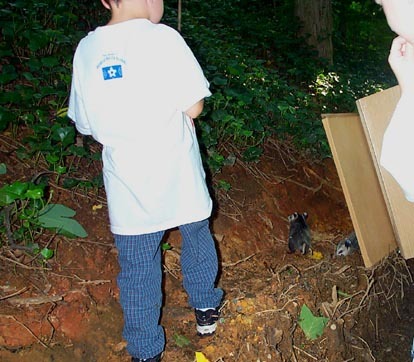 Do you remember the possum that you and Mom and I watched that night outside the kitchen. These guys might have been her babies. I hope that everyone finds each other. Rachel is sleeping over tonight. She is sleeping in your bed. Rachel brought a photo of Aunt Abby to keep her company. The red box is Jack's memory box of you filled with some of your things. I better go help Mom get Rach and Jack to bed. I got very bummed out today at work. I was in a meeting with folks whose job it is to sign up people to donate new blood. They work for an organization called the National Marrow Donor Program. Dr. Wagner does a lot of stuff with them and he asked Mom if she wants to work with them, too. Anyway, back to this meeting. The people were talking about some newspaper and magazine ads they were going to use to get people interested in donating new blood. They said the ad would be a photo of a family with a mommy and daddy and kids. In the photo one of the people's heads will be ripped out to show what happens when you can't find a match. When the person explained this I just smiled and didn't let anyone know how much it felt like I just got punched in the stomach. But boy that was awful to hear and to picture in my mind. I am glad that I can do stuff to help these people but sometimes I hear things that really hurt. You aren't supposed to be sad or cry at work so I wait until I get home. This was taken by Norman at Uncle Peter and Aunt Alice's beach house. This captures the way I think about us better than anything I can write. Happy anniversary of your transplant. July 6, 2000. That was going to fix everything, right. Every year we have a birthday party on the 6th to celebrate the start of your life anew. No cake today. Uh-oh, I am in our room but I am pretty sure I hear Jack crying in your room. Mom went to go check it out. 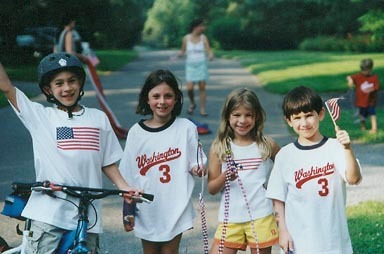 Just like last year we all went to Rehobeth Beach to Aunt Abby and Uncle Andy's house for the Fourth of July. Mom reminded me that last year you and I stayed behind at the house when everyone went down to the beach club for the festivities. That is where I always wanted to be, by your side. I went with everyone this time. It was a beautiful evening. The sunset took a long time. It was a gorgeous red sky - sailor's delight, correct. There was a slight breeze. Everyone went out to climb on the jetty. Fireworks were going off all over the beach. Mom spotted a dolphin swimming really close to shore. It was the way it should be. So what did I do, I sat in the sand and wept. Mom came over and put her arm around my shoulders. I couldn't stop crying. Nobody noticed, which is good. I don't want Jack to get any more sad than he already is. He and the cousins ran around with glo-sticks. All of a sudden I remembered that I had bought a bunch of big fireworks before I left Washington and they were out in the parking lot. I went and got them and set everything up on the sand by the water's edge. I set one off after another and put on a good show. I was thinking of you when I bought them. I asked for whatever they had that were big and spectacular. I thought about how you loved the fireworks we set off on the dock at St. Michaels. You loved it. I have a lot to write about the weekend. I'll continue tomorrow. Here are some pictures until then. This photo is from last weekend in Annapolis. 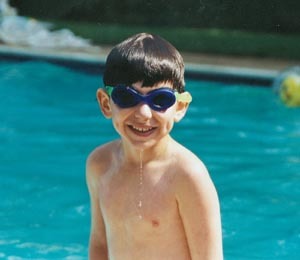 Jack's beautiful smile has disappeared since then. Here are pictures with the cousins. Jack had a lot of fun hanging out with Michael. Michael even won a jackpot at Funland. He got 450 tickets from one quarter on one of the games. They have a cool machine that eats and counts your tickets. You get a receipt to use when picking out your prize. 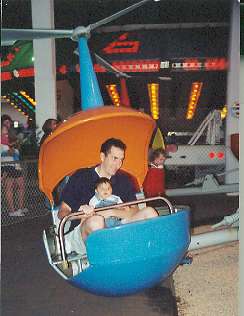 Here are pictures of you and me at Funland on the helicopter ride. We sure had fun. Mom's back. Jack was crying. He told her that he doesn't want to go back to camp. He doesn't understand why our family cannot be together during the day every day. He said he doesn't want to go back to the beach. It reminds him of you. Jack is trying to stop time. I have a lot to tell you about Jack. He is having a very rough time right now. Mom and I are going to pull together and make sure he gets through this okay. I think I told you that sometimes we feel like we failed you. We have to make sure we don't fail Jack. Check this out. I am at my desk at work and Mom and Joe and Jack just got to the beach. 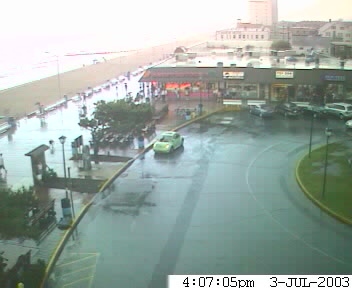 Rehobeth is 110 miles away, but I am able to see them on my computer. There is a camera on top of Thrashers. Does that car look familiar? I called Mommy on her cell phone and told her exactly where to stop the car so I could see them. Even though it is rainy and miserable, that car is always a sunny day. I am glad Mom has it. The person helping Mommy get her book published is telling us that everyone who reads it love the way Mom writes. She is such a great writer. You are lucky to have her telling your story. I think they only have a few chapters to read, though. I don't know if Mommy has given them all of the parts about how happy our life was. Hard but happy, that's us. I think someone smart is going to publish this book because they understand how many more lives can be saved and how many people will live their lives better if they have the chance to read about you. They realize that just because things are hard or sad doesn't mean they won't be interesting or important or helpful. Just look at the smiles on Mom's face and my face and Jack's face and Joe's face. That is what people will have on their faces when they finish reading about you. There might be a few tears, sure, but that is part of everyones' lives. You are like our car in the picture, a smile through the tears. Above all else, Mommy's book is a love story plain and simple. It is about the love Mommy has for you. There is a movie called Love Story, which starts with a voice saying something like, "What do you say about a 25 year old girl who dies." This book about you is the same thing. Mom is that voice. I saw a movie the other day on tv called, The Kid Stays in the Picture, about the man who made the movie Love Story. That movie saved his job and the studio where he worked because everyone went to see it. It was a big hit. Mom's book will be just like that. I think that whoever decides to publish your book is going to be really surprised at how many important friends you and Mommy have who work for big magazines, newspapers and tv networks. It is all these friends who are going to make sure people know there is a book about you that people can buy and read. I'm going to do my part by getting Mom on XM radio. That will be easy. We have a channel that people listen to because a lot of important writers come by and talk about their books and read chapter. I am going to make sure that Jeffrey is on that channel whenever he finishes his book. Okay, back to important things. I bet you are thinking right now about the Candy Kitchen, which is lit up in the photo behind the punch-buggy, and your favorite destination just two blocks down the boardwalk: Funland. I'll report back about Funland and the rest of the good times at the beach after I join Mommy and the guys at Aunt Abby and Uncle Andy's house later tonight after I finish work.